Mostly Pacific slope, dry to moist forest. Fl. Dec. to Mar. 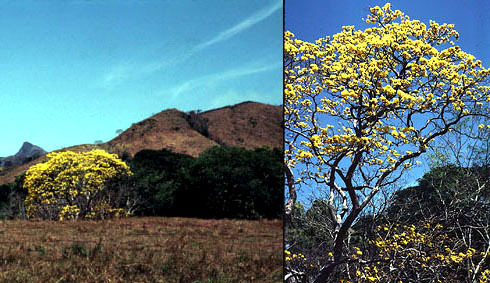 This species of Tabebuia (Bignoniaceae or Trupet Vine family) is one of several that exhibit "big boom" type floral displays, all the individuals in an area flowering together over just a few days, making a big splash of color in contrast to the surrounding area, and thus attracting large populations of pollinators. Another species in this genus with pink flowers, T. rosea, is also common in Costa Rica.